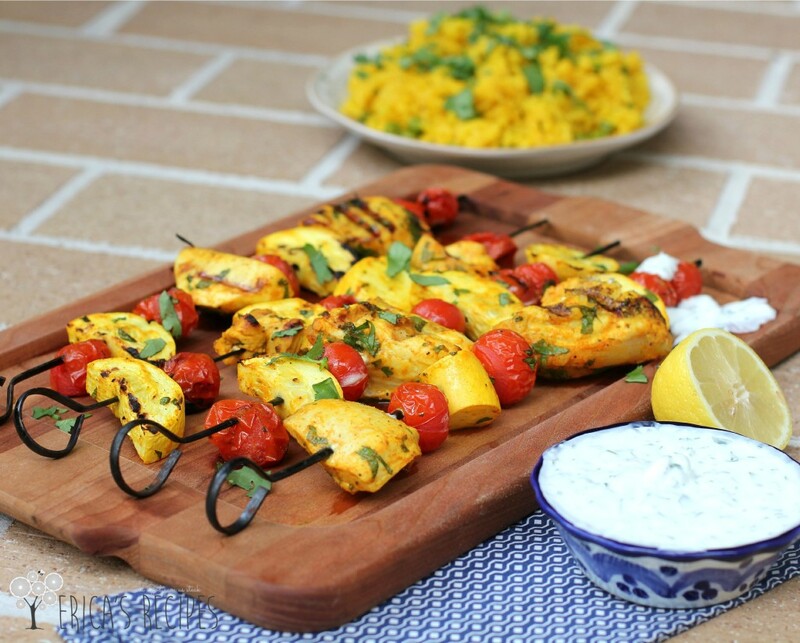 Persian Swordfish Kabobs with Cilantro Tzatziki are light and easy to prepare, but loaded with Persian flavors to satisfy. 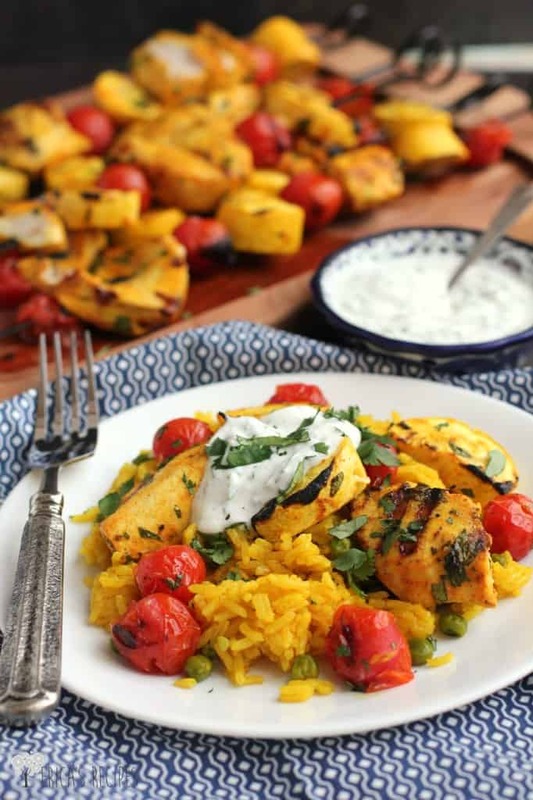 Make healthy grilled, quick-cook recipe for your family any day of the week! This Persian Swordfish Kabobs with Cilantro Tzatziki recipe is my rendition of yummy swordfish kabobs I have had at Persian restaurants. There’s a little restaurant in Virginia, outside Washington DC, where I remember one meal specifically with fresh hummus, naan bread, and turmeric rice (all of which I have recreated, see my rice pictured above!) …YUMMM-O! And now these kabobs complete my memory so I can have this whole tremendous meal at home. Now, before you start yelling at me “but Erica, swordfish is expensive!”, here’s the thing… swordfish was on sale $8.99 a pound last week, but even then I was undecided if I wanted to spend $14 on fish. But then my daughter noticed the bin of $6.99/lb assorted swordfish chunks from trimmings. Sold! I absolutely love the flavors going on here. The spices, combined with the smokey awesomeness that can only come from cooking on the grill, complement swordfish perfectly. Then add a little dippity in cool, herbed yogurt, and it is awwwllll just right. …Oh yeah, and healthy too! In a bowl, whisk together the lemon juice, olive oil, cilantro, turmeric, paprika, coriander, cumin, salt, and pepper. Toss in the swordfish, squash, and tomatoes to coat. Marinate 30 minutes in the fridge. In a small bowl, combine the ingredients for the Cilantro Tzatziki. Chill until ready to serve. Heat the grill to high heat. 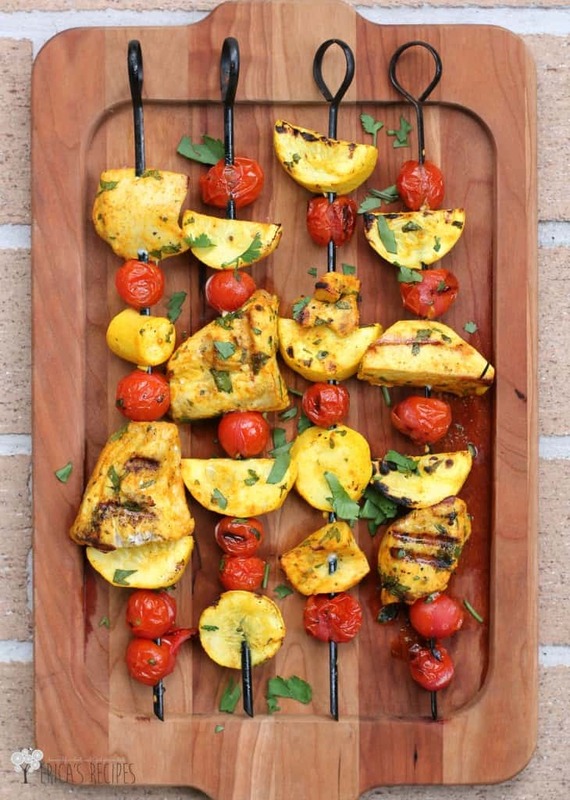 Thread the fish, squash, and tomatoes onto skewers. Grill skewers, 5 minutes per side. Serve with Cilantro Tzatziki. Yield: 4 servings. I love swordfish! And this looks excellent! Lots of colors and flavors going on here! Yum! Wow! This looks amazing! I’ve never had swordfish, but you make it look so good! This looks and sounds delicious. I love swordfish and the seasoning combination you’ve got going here is amazing. Bravo. Is it swordfish season? I was visiting another blog last week and they made swordfish as well. To be honest I am not a big fan of fish but for whatever reason this is one I am really attracted too. I need to try it. Maybe next year on the BBQ! Yummy! And the pictures are great – well lit and colourful. what a gorgeous and healthy meal Erica. And beautiful photos too! What a fabulous dish Erica! 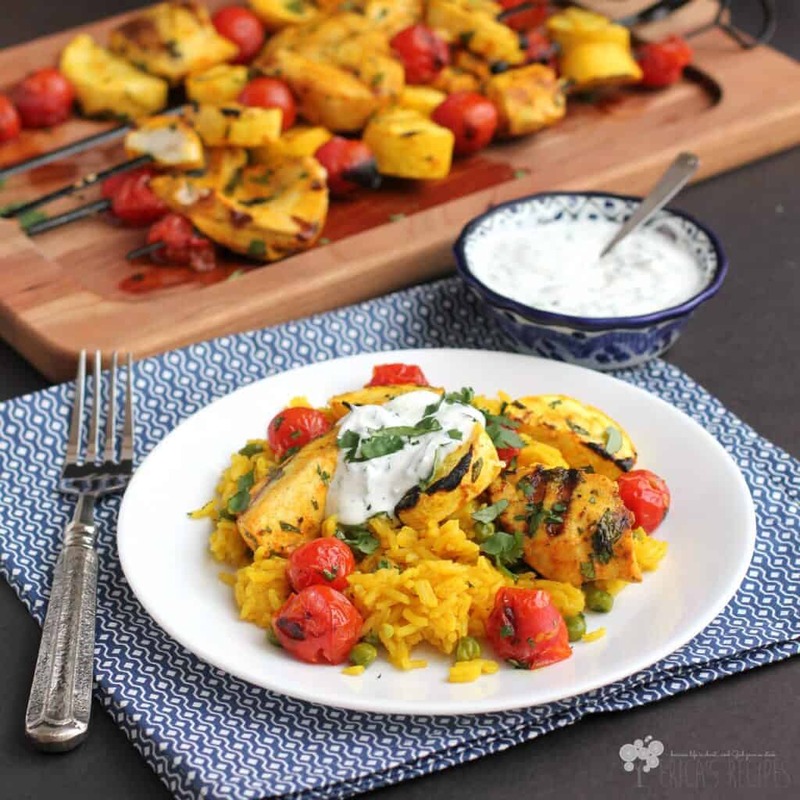 Persian cuisine is one of my most favorites and I hope to be able to try your dish very soon! Stunning photos too! I LOVE Persian food oh so very much!!! This looks fantastic!!! I may have to steal this recipe and use it for chicken since I’m not a fan of swordfish 🙂 Thanks for sharing with us on Foodie Fridays! As always your pictures look gorgeous! You’ve got such a great flavor profile going on in this recipe. Sounds delicious! We don’t have any Persian restaurants near where I live… the flavors look amazing in this dish. Thanks so much for bringing it to foodie friday. Pinned.